When the merchant Willy Martin and the precision mechanic Fritz Tschopp set up their company together in 1941, they were driven by the vision of manufacturing top quality precision mechanical products in the style of the world famous Swiss clockmakers. 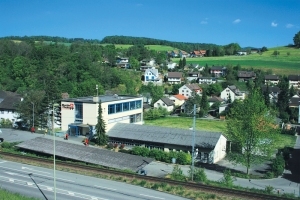 The result of this vision is the company Martin + Tschopp GmbH, an internationally renowned full-range supplier of cylindrical gauges and ground shafts. In a unique combination of modern and efficient production procedures coupled with the inherent Swiss quest for perfection, we develop and produce excellent cylindrical gauges and ground shafts "Made in Switzerland" for the world market. The challenge we face in the future is to continue perfecting this art in the spirit of our founders and to the benefit of our customers. Our services and the added value we offer you are marked by the same level of perfection and precision with which we develop and manufacture our products. Our customer managers are specialists who see their jobs as a vocation and who are happy to advise you comprehensively. We can deliver many of our gauges from stock. In addition to our extensive standard program, we can also supply measuring equipment tailor-made to meet your needs. And if things need to be done quickly, you can take advantage of our express or super express production service. On request, we can also calibrate your high-precision cylindrical gauges in our modern measuring laboratory.